Today we will take a look at the USB 2.0 Development Board assembled by Waveshare. It is based on Cypress FX2LP chip CY7C68013A (56-pin package) with the 8051 MCU, 16 kB RAM, 8/16-bit parallel bus, I2C, GPIF and USB 2.0 interfaces. There are three 8-bit I/O ports: A, B, D. 100-pin package has additional ports C and E, USART, three timers and etc. Keil uVision C51 is one of the best IDEs for MCS-51 firmware development. Another great development tool is IAR Embedded Workbench. GNU C/C++ does not support MCS-51 instruction set, but you can try to use SDCC free compiler. Now start your IDE and select “Project->New uVision Project…” menu item. Choose a folder for your project and type project name. Now you are ready to select the MCU. Create new source file “main.c” and add it into the project. For successful linking you will need STARTUP.A51 assembler source file. It will be linked automatically from \Keil5\C51\LIB folder. The EZUSB.LIB file is required for more complex projects with USB support. It can be found in FX2LP SDK examples. Use “Small” memory model and “Large” code ROM size. Turn-off code optimization. When you compile this project you will get “blink.hex” file in your \Objects folder. 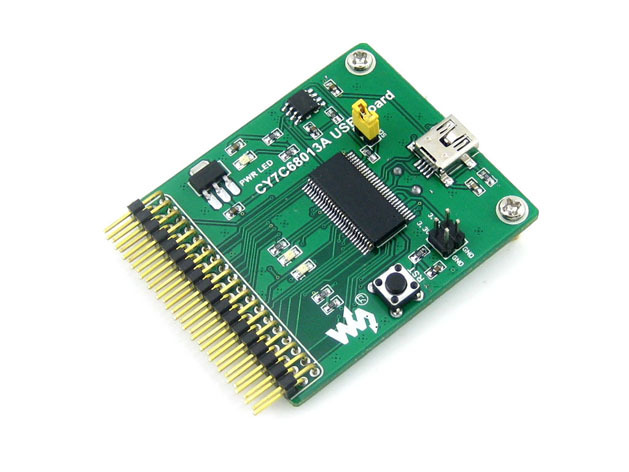 There are four options to download firmware into the Cypress FX2LP MCU. The firmware must be written to the on-board RAM and executed. The first method is to use Cypress default drivers and transfer firmware into RAM with CyControl application (the source code is available). When you reset or power off the MCU the firmware will be erased. The second method (0xC2 option) is to store the firmware and the bootloader in the EEPROM permanently. Anyway you will need CyContol application from FX2LP SDK to program the MCU. 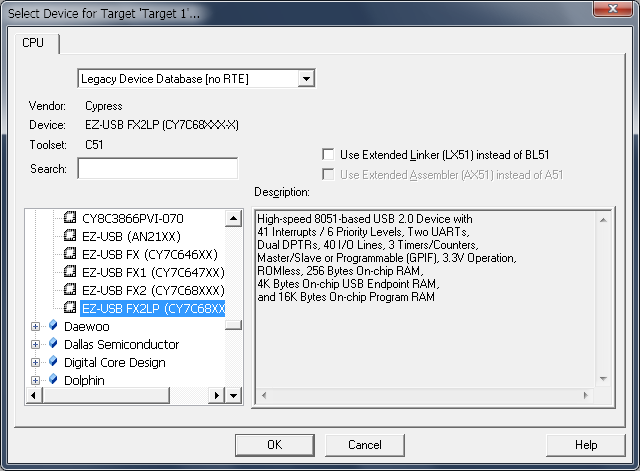 Select “Cypress FX2LP No EEPROM Device” (or equivalent) and choose menu item “Program → FX2 → RAM”. Point to the “blink.hex” file and wait several seconds until you get the “Programming succeeded” message in the status bar. Now you should see blinking leds. At power-on reset the FX2LP checks for EEPROM connected to its I2C bus and reads the value at address 0. For value 0xC0 the FX2LP automatically copies the VID, PID, DID from the EEPROM into internal RAM storage. The host OS loads corresponding driver and so it works. For value 0xC2 the FX2LP downloads firmware from EEPROM into RAM via bootloader. When your firmware is ready you can download it to EEPROM. You will have to convert your firmware from .hex into .iic file. It can be used as a command line tool or as an after-build script in uVision IDE. -o sets output file name. Default Vendor ID is 0x0547 (Cypress semiconductor), Product ID 0x2131 (EZ-USB chip) and its driver “ezusb.sys”. The Vendor ID 0x0547 sometimes refers to Anchor Chips. This company was acquired by Cypress several years ago. 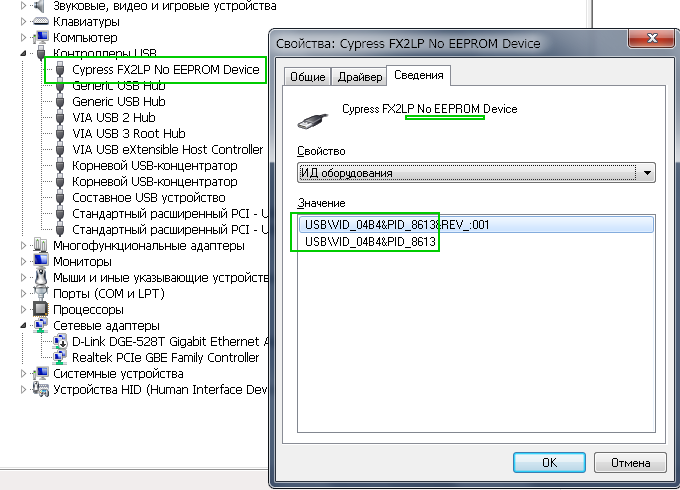 One more compatible, digitally signed and useful driver from Cypress is: VID = 0x04B4, PID=0x1004 “Cypress FX2LP Sample Device” and the driver name is “cyusb3.sys”. 1. Disconnect the board from USB or turn-off the power cable. 2. Remove jumper (yellow) from SDA line. 4. Put the jumper, i.e. connect the SDA line. 5. Run “CyControl” utility and program EEPROM with any valid VID/PID (use myReset.iic from zip-file). 6. Wait for successful completion and reconnect/reset device. I should say a few words about the jumper. If you take a look at the board schematic you will find that P_SDA jumper connects SDA and SDA_E lines. When the jumper is absent the AT24C164 (Serial EEPROM 16K) is not accessible by the MCU. In that case the MCU loads default VID/PID and does nothing. There are many logic analyzers based on the FX2LP CY7C68013A chip. These devices store configuration in EEPROM. Before erasing or resetting your device make sure you have a valid firmware and configuration files. Happy programming! Feel free to comment. This entry was posted in Firmware and tagged CY7C68013A, Cypress, FX2LP, USB. Bookmark the permalink.